Okay, she may be a bit more Burgundy than red, but she is gorgeous, and we cannot tell you what a blessing she is. For everyone in the nursery business, having a good vehicle is a must..we work in them, we practically live in them, we schlep plants in them, we are hugely dependent on them to get us where we need to go and they go many miles, under less than ideal terrain.....and our biggest challenge over the past 10 years was driving around in a truck with no A/C ! And we know you can truly appreciate the fact that having A/C in our Florida summer months especially, is almost a life-saving event. As many of you know, Mitch suffered a heat stroke at the nursery a few years back and ever since, the heat is very hard on him. We basically have been driving around in an old Black truck, with black interior, with no A/C for years and it was getting to be just too much. We want to share this story just to show another example about how about good karma and praying for an answer eventually (not always when we want, right, huh?) happens. Bear with me..long story, short. Ah, the storm moves off, the bridge is open, phone calls are made and we are on our way..and what do we find? 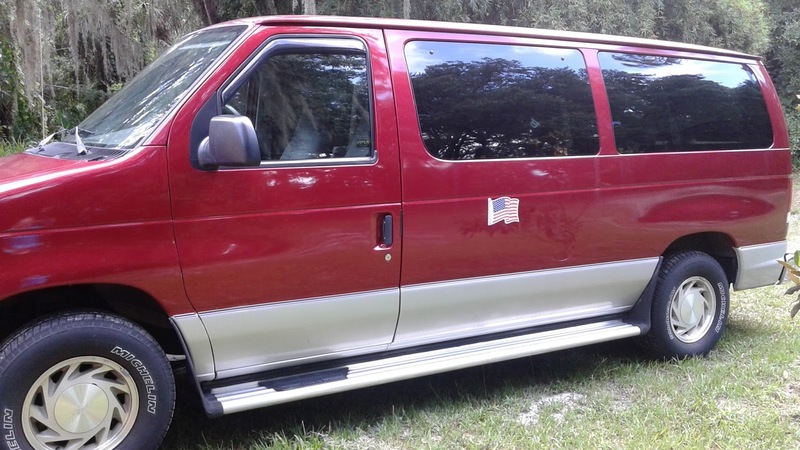 We find a great vehicle and an even greater seller, that reminds us of the depth of goodness of humanity.....Joe....Joe from New Jersey...a retired Firefighter who is now nestled in the sunniness of Florida after many a hard winter. Joe, who we come to find out, is the original owner - he bought this van with visions of pulling a lovely boat into the wilds of Florida after retirement. He used it while at work but kept it garaged in harsh winters. He lovingly took care of it and spared no expense. He brought it to Florida after retiring and then found - he didn't really need it anymore -they had another smaller vehicle for his needs, and for that boat..it sits nicely behind his house..a wonderful pontoon boat, for fishing. So, Joe puts it for sale. It's his baby and he wants it to go to a good home. It has history and loving, as long as you understand you can love a car and what it represents. It was a bit bigger than we needed (it can hold a church choir), and would take every bit of our savings. And we are going to have to scrape through summer dependent on our supporters. But it was gorgeous, in great condition, low millage and it would carry a LOT of plants, if need be. And it had A/C..full, cold, blasting working A/C. Not only did we get a great vehicle, but we made a new friend,and, turns out, Joe is quite the cook, so we got 3 amazing Firehouse recipes too. It was meant to be, we really believe that. After so much time of searching and more Ink than we care to think about printing out pics of trucks from Craigslist, we have a new home..on wheels. We like to think, after so much waiting, that this Old Van has a new life with us. And we have a great story behind it. So, Annie named her Josephine...after the man we got her from. We thank and bless Joe.......who knew so many years ago when you bought her new, that she would be a lifesaver to people you did not know ?! It's just a van, but to us, she is a Jersey Angel on wheels.